Akio Yamamoto, besides being one of the designers with the most Cast Puzzles released, is also responsible for many of the best-looking and most elegant designs in the popular Hanayama series, as is the case of the Radix or the Marine Series. Yamamoto is also a romantic, and proof of that is clearly seen in two of his creations, the Cast Amour and the Cast Dolce, with the latter being the one reviewed today. The Cast Dolce is yet another one of Yamamoto's masterpieces, which by coupling together the two universal symbols for male and female (also known as the astrological symbols for the planets Mars and Venus), he not only created an exquisite puzzle, but also a graceful and artistic object of admiration. 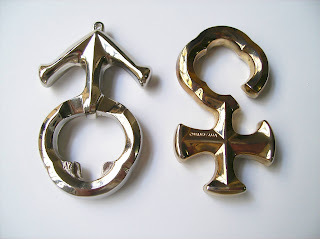 The contrasting colors of silver and gold are a nice metaphor for the two opposite sexes depicted in the puzzle. 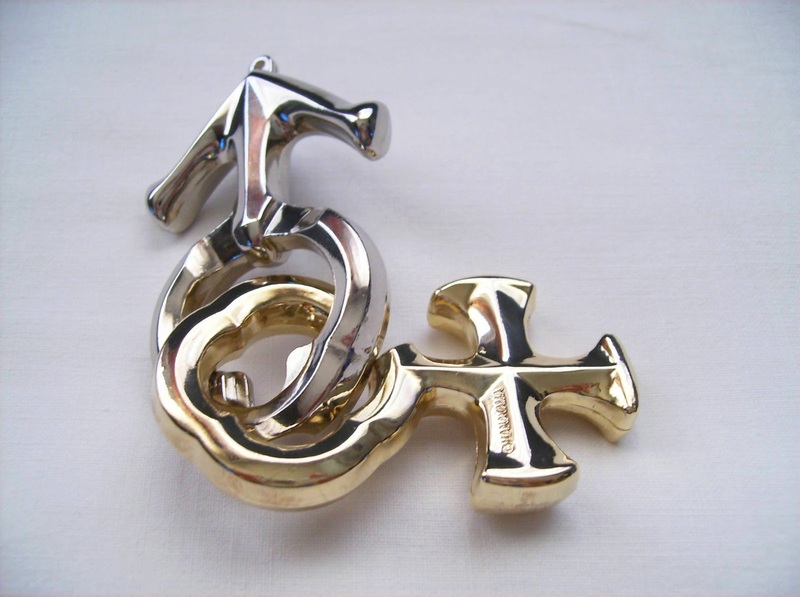 The Cast Dolce was released by Hanayama over 10 years ago on January 2002. The puzzle itself is not overly difficult, but for a difficulty level 3/6 it sure puts up a fight. Separating the two pieces can be more troublesome than you'd expect. The golden part has an opening which must be aligned to the silver's notches at the center, but the solving process is a little more complex than that. 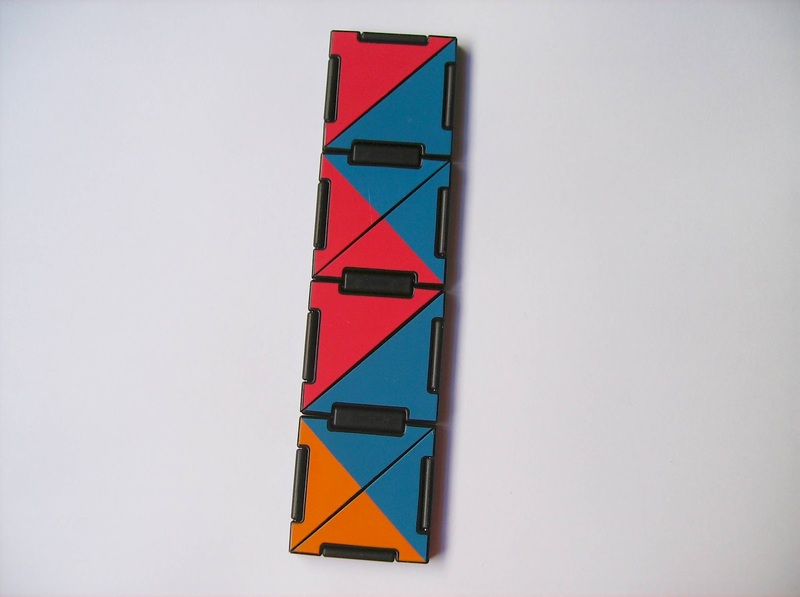 What's interesting about this puzzle is that its main features let you know only part of the solution, since it is obvious that the opening should pass through the notches, but you need to find out the correct angle and right sequence of the steps needed, and that is no easy task. After solving the puzzle for the first time and while I was trying to put it back together, I found that it's possible to solve the puzzle with just one single movement, and no, it doesn't involve brutal force, just a slight pressure. Is it just a design flaw or is it supposed to be like this? - I honestly don't know, but it sure it's easier than following a series of steps. Let me know if you also found this alternative solution. The Cast Dolce may not be the most difficult puzzle you'll ever solve, but what lacks in challenge definitely compensates in beauty and elegance with a perfect harmony between the two pieces. A great gift for someone you love or just for the romantic at heart. Availability: The Cast Dolce is available at the Finish store Sloyd.fi and you can find there all the other Cast Puzzles in the collection as well. 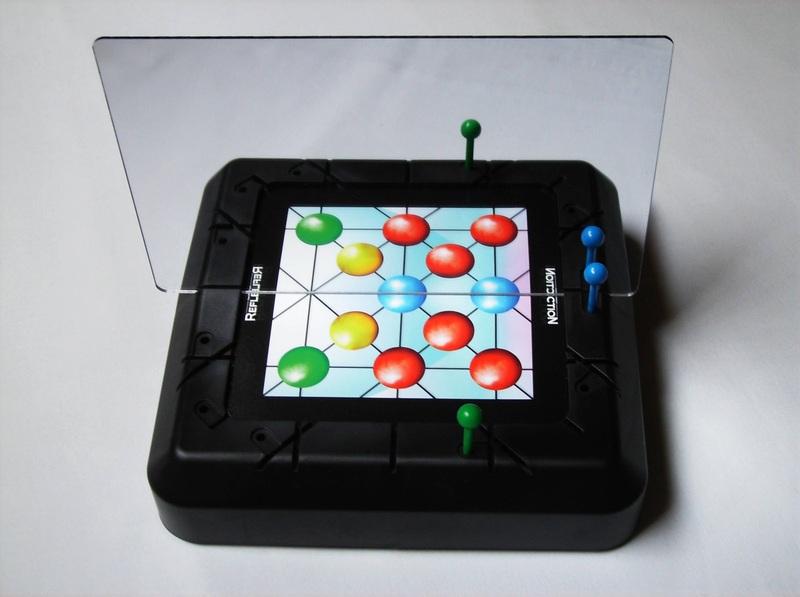 PuzzleMaster isn't just a large mechanical puzzle retailer. They create and manufacture great puzzles as well, and the Twisted Gem is a very nice example of their superb craftsmanship. 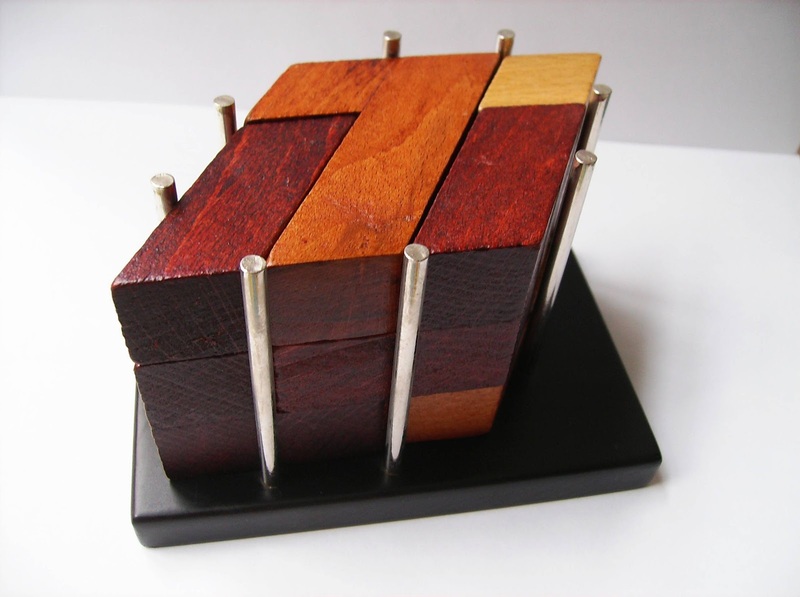 Standing on a base with a smooth black finish and surrounded by eight metal sticks, the seven wooden pieces with contrasting colors complete what seems to look more like a trophy than an actual puzzle. Solving this apparently simple challenge will prove to be a more arduous task than you'd think. 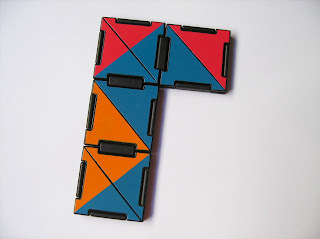 The pieces are comprised of six tetrominoes and one tromino - I actually am not exactly sure if the pieces can still be called polyominoes, since they're not squared anymore - but instead of having a squared shape they were twisted (like the name suggests) on a 30º angle to form a rhombic shape. This subtle change in the overall appearance makes it much harder to visualize how the pieces stack on top of each other and ultimately, how can they fit inside that tiny area again. I tried again to solve it, before writing this review, and after an initial fear of spending another great deal of time with it, I managed to solve it in less than half an hour - Not bad for a level 9 puzzle, according to PuzzleMaster's rating system. 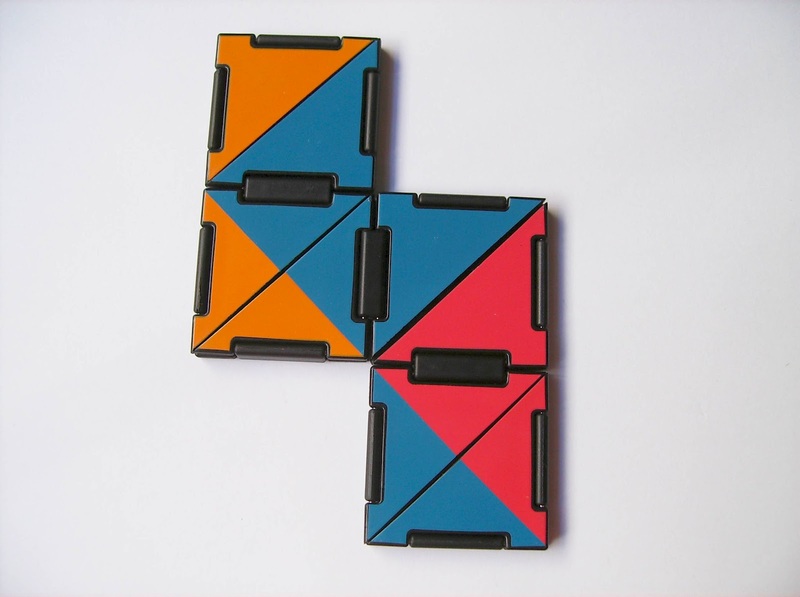 I compared the solution I had with the one provided by PuzzleMaster and I found they're the same one, simply by flipping the entire structure. Although it's not proof that it's the only solution, it does look like there's only one way to stack the pieces in a diamond shape. The Twisted Gem is one of the prettiest and most elegant puzzles I have from PuzzleMaster. The concept is a breath of fresh air from all the squared-shape puzzles out there and it's a great challenge for anyone looking for a little puzzling frustration. Availability: The Twisted Gem is available at PuzzleMaster for about $12 CAD - A bargain for this kind of puzzle. 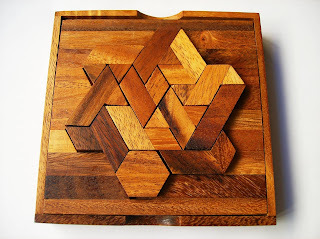 Today, I bring you another cool puzzle from my favorite designer, Jean Claude Constantin. Eingeengt, which translated from German means "concentrated", is a fitting name for this unusual design. Can you "concentrate" enough to solve this one? 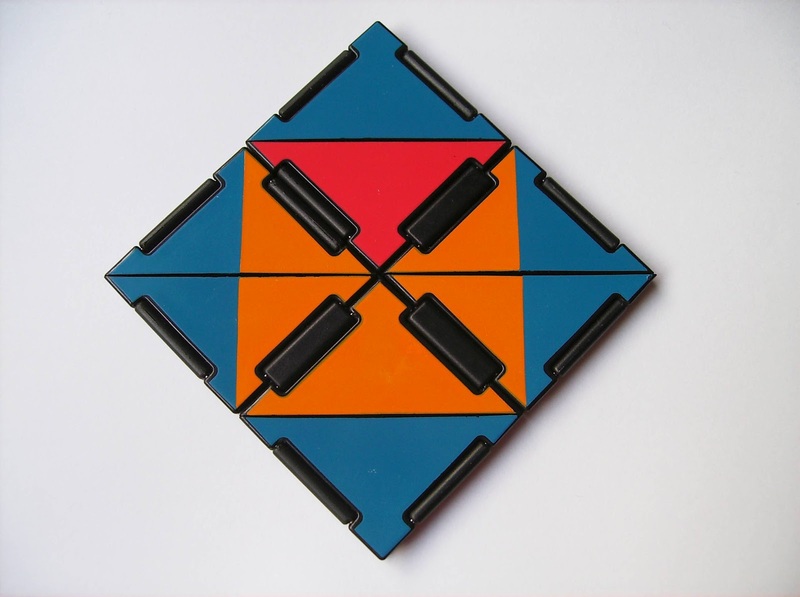 Eingeengt consists of only six pieces (hexominos - six unit pieces) that are trapped under a wired frame, which blocks most of the movements required to solve it. When you see the puzzle for the first time it's not solved. Your task is to remove the pieces one by one, in a sequence, and put them back in, but with the correct arrangement in a 6x6 square. The design is simple, but very elegant. Four small metal bars are placed around a wooden base, long enough to hold the edge pieces in place. 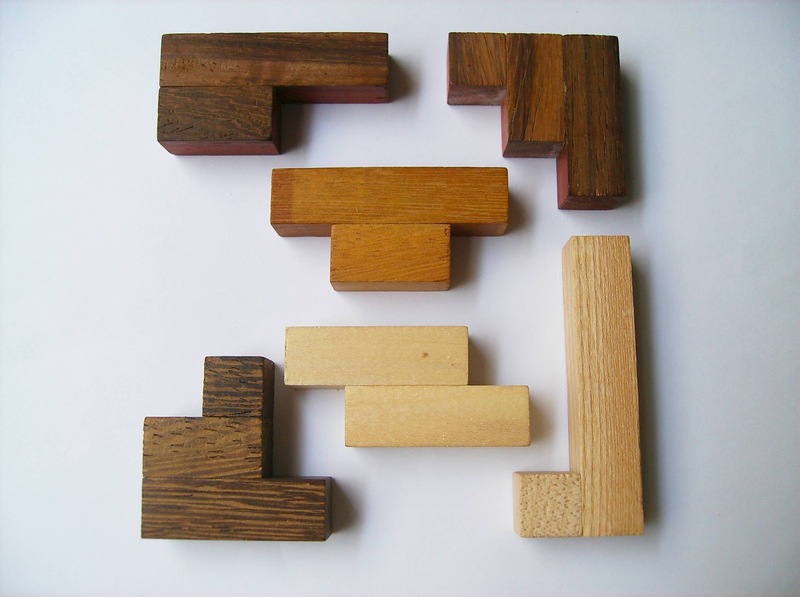 The pieces are carefully chosen with contrasting colors for a more pleasing visual effect, and even though it's a small puzzle, measuring about 10.5cm (4.1"), it feels heavy in your hand due to the high-quality wood used, especially the base. The puzzle is not that hard to solve, but it's challenging enough to provide a good and satisfactory experience. The first step in solving it is to try and remove the pieces, and since it doesn't come already solved you don't need to worry about leaving it unsolved. When you have all pieces out of the frame it's best to try solving it outside the frame, because you don't have any constraints with how to place the pieces. You already know that the finished puzzle occupies 6x6 area, so when you finally accomplish this goal you just need to transfer the pieces back inside the frame. The strategy for placing the pieces inside the frame is basically the same as removing them, only it's backwards. 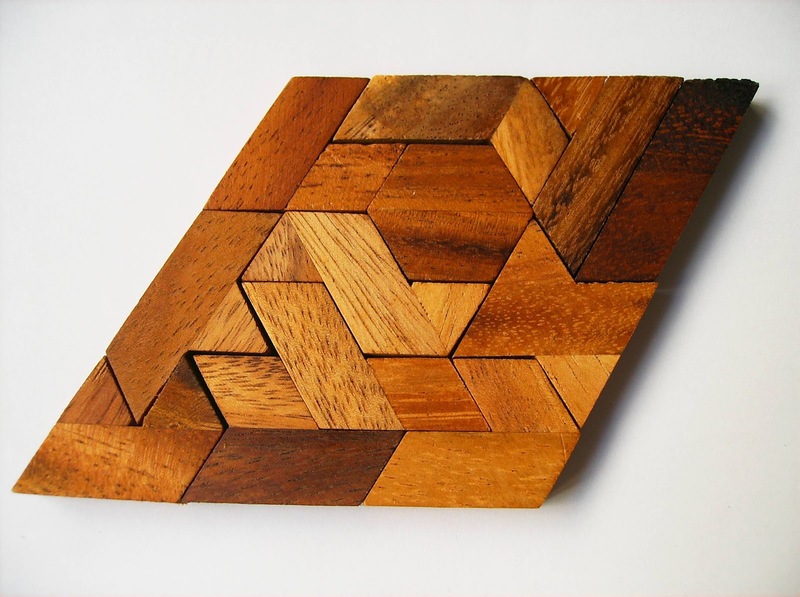 In order to be able to move all the pieces around, you need to place first the five edge pieces around the frame, followed by the sixth and last piece. This is pretty much a simple and easy task. The only part that should offer a little challenge is finding the correct six-piece arrangement, and even that is done within 10 minutes. By the way, I'm not sure how many different solutions are there, but I always ended up with the same layout no matter how hard I tried. It may actually have just one solution. Solution: Click here if you'd like to see the puzzle solved. Another superb puzzle by Jean Claude Constantin. 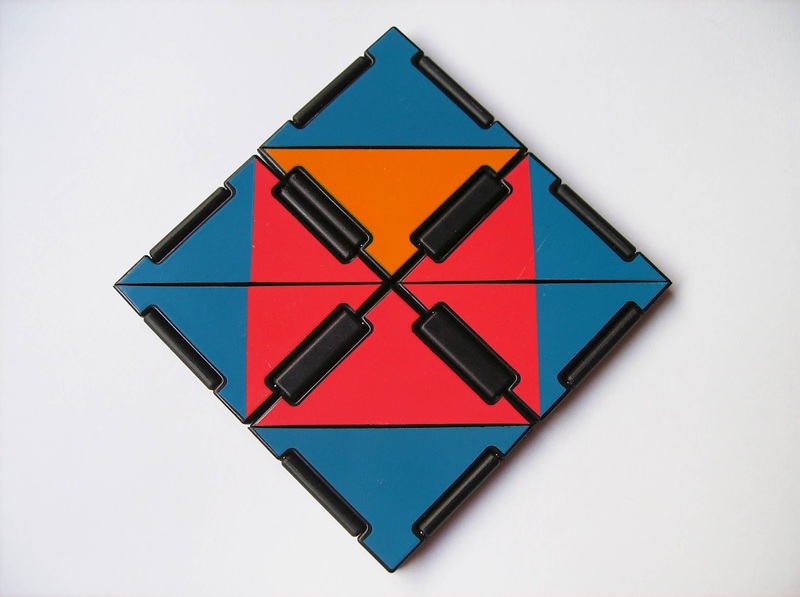 He managed to turn a simple hexomino packing puzzle into a highly original concept with brilliant execution, combining elements of sequential movement and assembly puzzles. If you're looking for a good packing puzzle give this one a try, and you won't regret it. 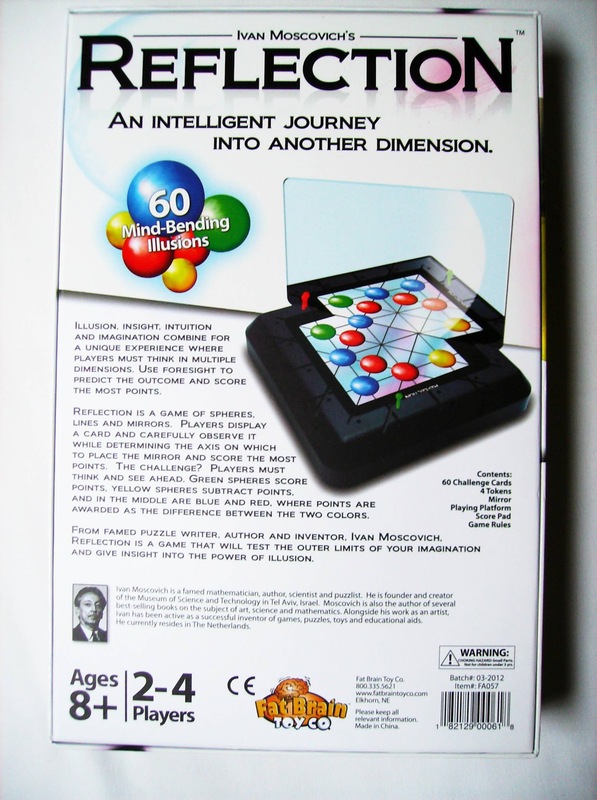 Availability: The Eingeengt puzzle is currently available at Sloyd.fi for €23.50. 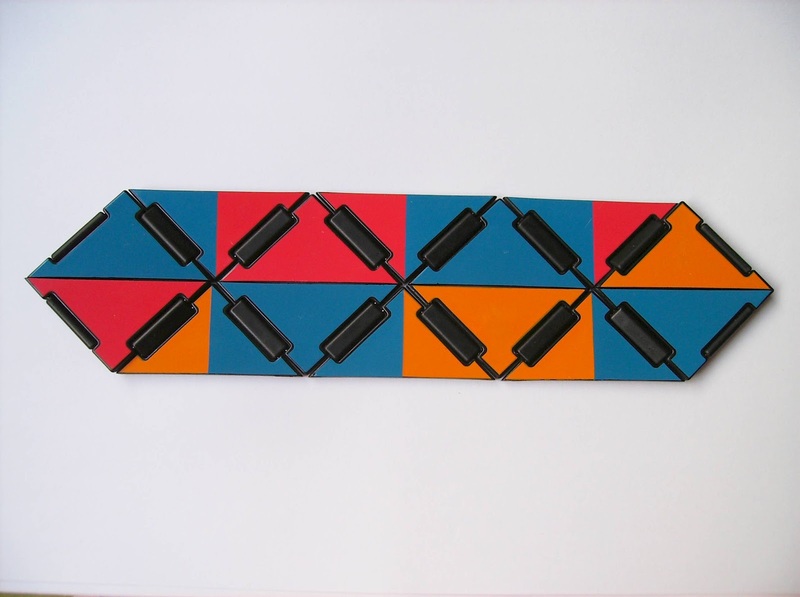 Continuing with my reviews on some of the best Ivan Moscovich's creations, this week I bring you a different type of puzzle, a board game. Now, usually I'm not a big fan of board games, because I don't find them challenging enough and most of them just rely on luck to find a winner. Fortunately, Ivan's Reflection, manufactured by Fat Brain Toys, doesn't need a couple of dice to determine who wins. Instead, victory belongs to the player who best uses his visual and spatial abilities coupled with fast decision making. 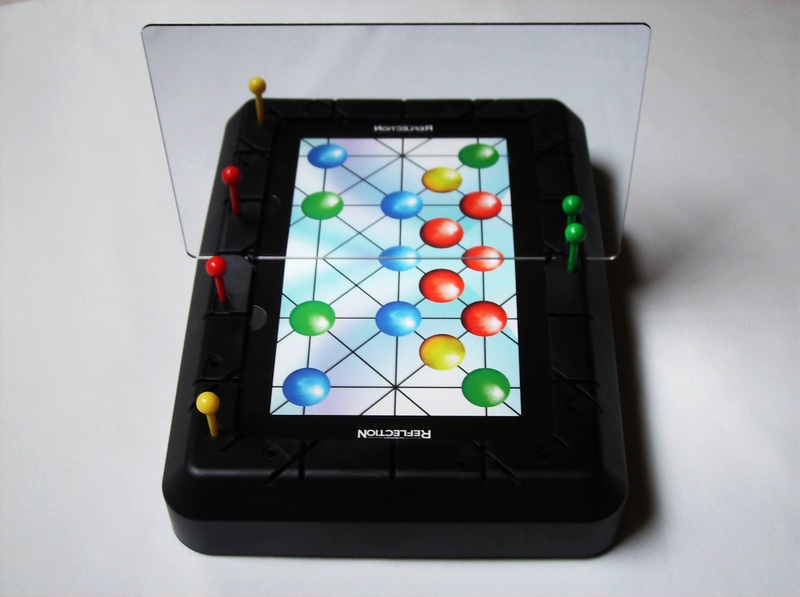 Moreover, it's a game that helps you keep your brain healthy. The game comes with 60 cards, and each one has a different arrangement with four possible colored spheres (red, blue, green and yellow). Not every card contains all four colored spheres, though, and the total number of spheres varies from card to card. 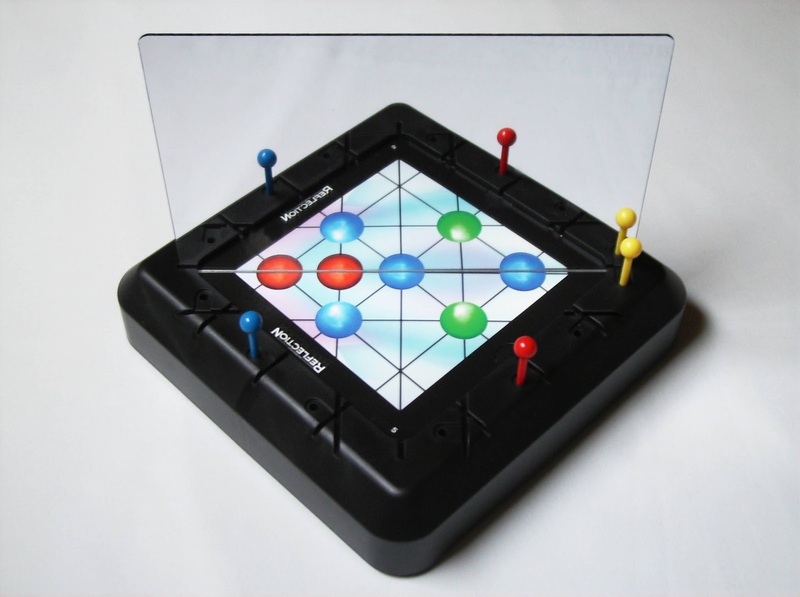 You start the game with one of the cards and up to four players choose one of the 10 possible axis lines of symmetry. 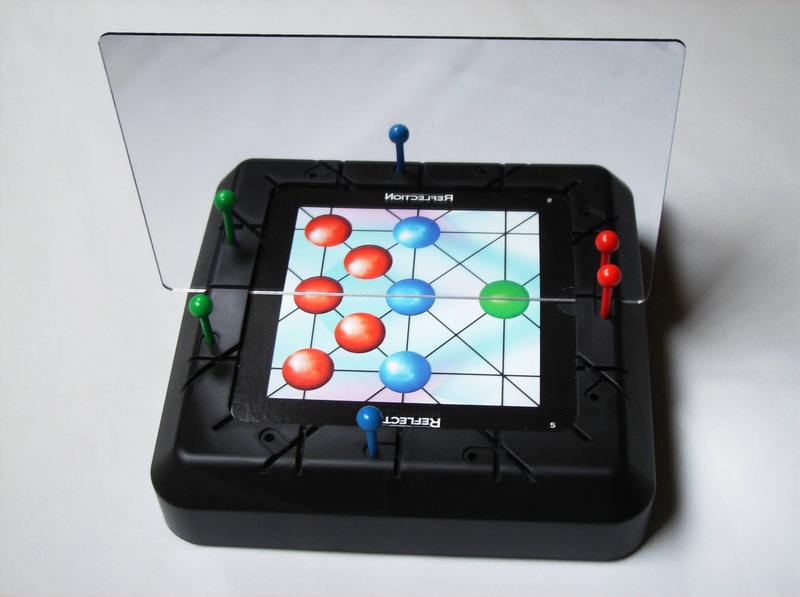 Each axis line can also be reflected from both sides, making 20 symmetry lines in total, so each player must choose which side they want to be reflected prior to place the mirror. 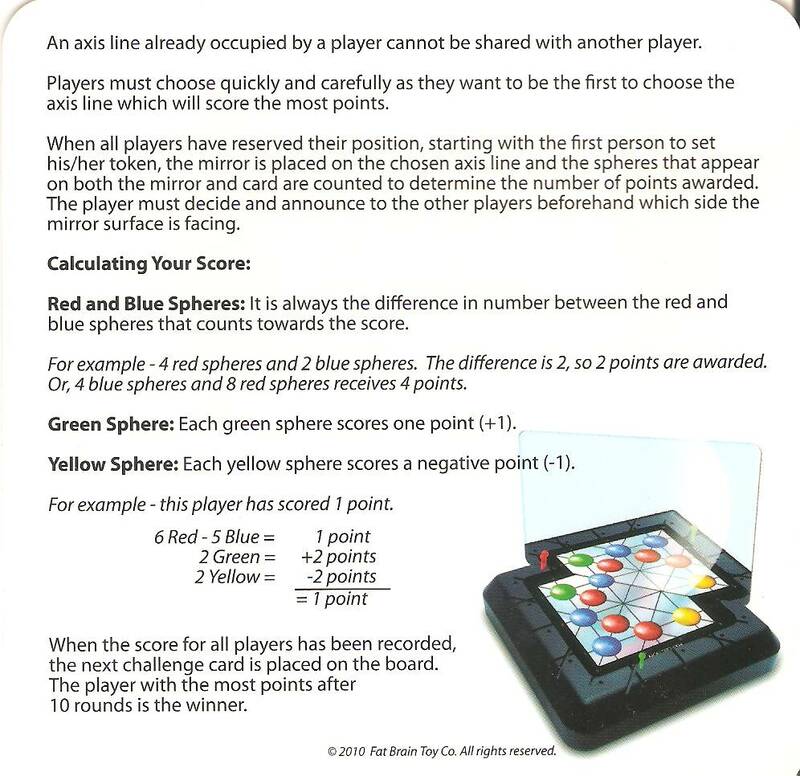 When all players place their tokens on the board signaling their chosen axis line, the mirror is placed and the spheres are counted to see who scored the most points. You count all the spheres you see, both on the card and on the mirror. Note that no two players can share the same axis line. The scoring is simple: First you count the red and the blue spheres - It's always the difference between red and blue, and not the other way around. Then, you add the number of green spheres and finally, subtract the number of yellow spheres. When all players' score is counted, place another card on the board. The player with most points after 10 rounds wins. What captured my attention right away was how the mirror is used to play the game. 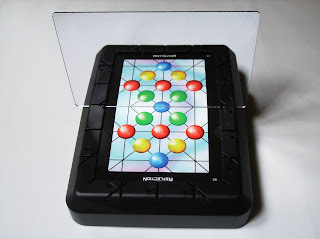 At first, you might feel a little confused by how the game works, but as you play you'll start to understand its mechanics and before you know it, it turns into this highly addictive battle between who can choose the best possible symmetry line. What I found most interesting, even after being more familiarized with the concept, is that it never ceased to surprise me, when I finally got to see the actual reflection contrasted with the image I had in my head. 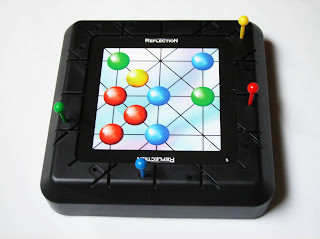 Obviously, with experience, you gradually can predict with more certainty what the final sphere arrangement will look like, but in the heat of the game and the pressure of choosing the best line first, there'll be times where you get unexpected results and think to yourself "How did I miss that?". As mentioned above, there are strategies that you, with time, will learn how to use in order to get the most points. 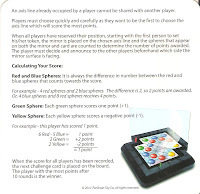 Spotting which lines capture the most red and green spheres, and avoiding the ones with blue and yellow spheres are some of the best ways to win the game. Also, sometimes it's best to go for a low sphere count and have a positive score than to risk on an axis line with plenty of spheres, which ultimately can result in a negative and unexpected score. Throughout my experience with the game, I've seen scores go as high as 7 or as low as -5. I'm not certain what's the maximum or minimum score, but they pretty much vary between these numbers (see examples below). 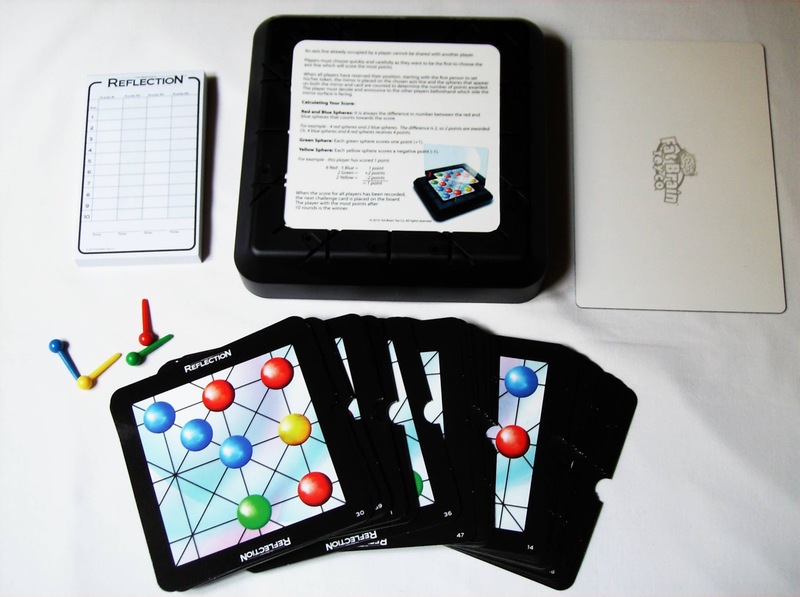 Reflection is essentially a multiplayer game, but it's also possible to play it solo, although it's not as much fun. 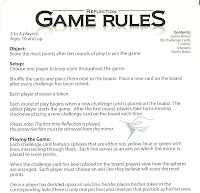 One of the ways to play it solo is to pick a random card and, without using the mirror, try to find an axis line that will yield the most points and one that will yield the lowest possible score. When you think you have the two highest contrasting lines, use the mirror and check all the other lines to see if you were correct. It certainly serves as a nice training for when you're not playing with others. 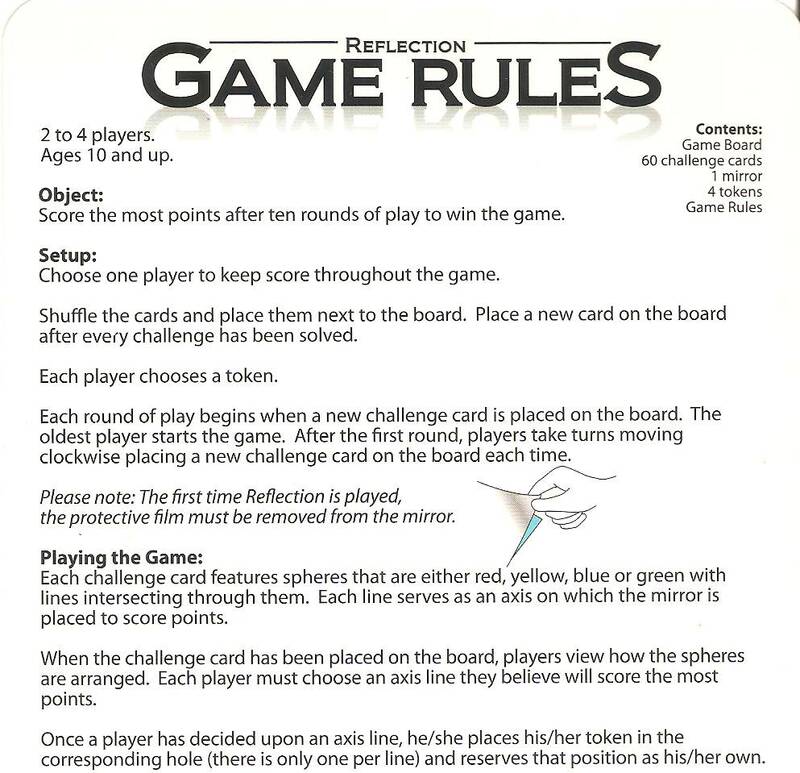 Ivan's Reflection is probably one of the best board games I've ever played. I was very surprised at how much fun and addictive it can become once you get into it. The rules are simple and easy to understand, and it's based on your skills to be won and not on pure luck. The high number of challenge cards keeps the game fresh for a long time, and most importantly, it never gets boring. Highly recommended for any puzzle or board game fans. It's the ultimate battle of wits. 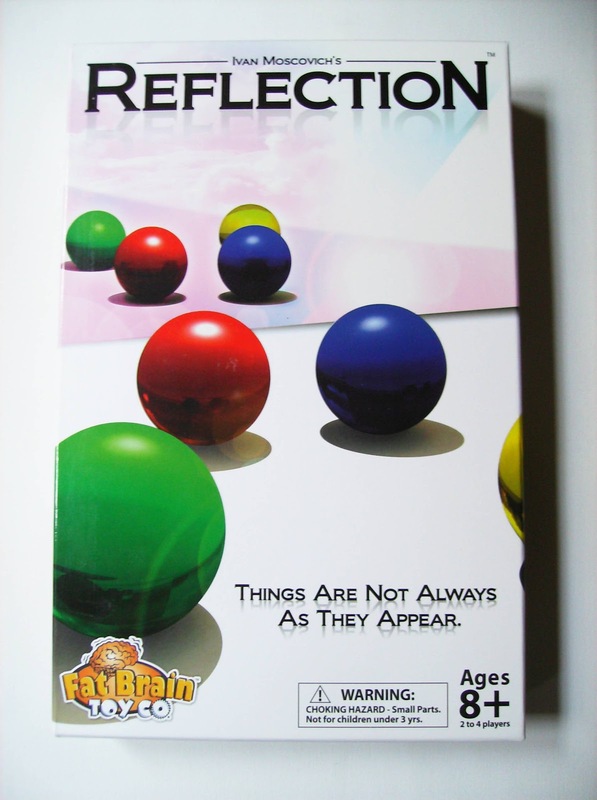 Availability: Ivan's Reflection game is available at the Fat Brain Toys website for about $25 USD. When you think of a good Cast Puzzle, the hardest ones are the first that come to mind (Cast News, Cast Enigma, for example). However, a good puzzle doesn't necessarily need to be hard to be fully enjoyed. 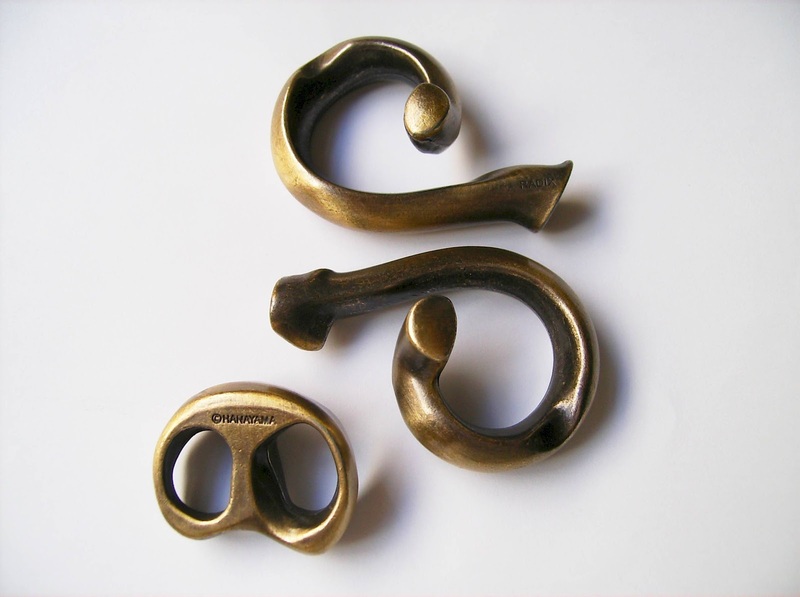 Vesa Timonen's Cast Loop, released by Hanayama in 2007, is one of such puzzles. Also, the folks at the 27th IPP seem to think the same thing as well, as they awarded it the Jury First Prize and the Puzzlers' Award. The key word for the Loop is "Synthesis". 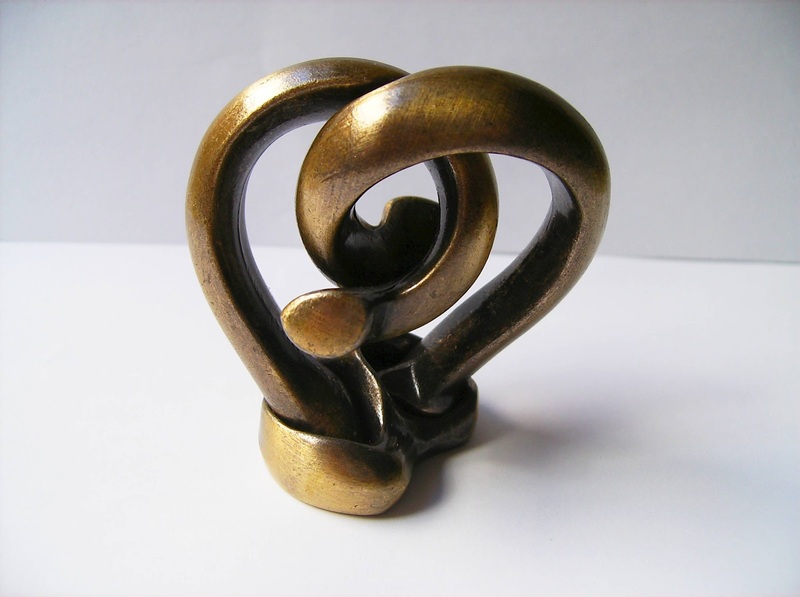 The included description of the puzzle is quite interesting, because it tells us that the design is based on an actual puzzle ring Vesa created for his girlfriend. It's amazing what you can come up with when you have motivation. The description also indicates that the puzzle can be used as an accessory when solved - a pendant, maybe? After some unsuccessful attempts, you begin to realize that in order to solve the puzzle you need a different approach. What intrigued me the most when I first tried to solve it was that this was a level 1 difficulty out of 6, and there I was, completely confused, trying to make sense of it. It took me almost 10 minutes to have that aha moment, when you finally discover the correct way to join the two pieces. The simple and yet genius concept is accomplished by this spiraling, corkscrew-like mechanism where the two parts - they're identical, by the way - are joined together. The finishing touch is done by two small magnets at the ends that keep the loop closed. Mine doesn't close perfectly, though. The two parts are slightly offset, maybe due to a bad positioning of the magnets. It's not clearly visible from the photo, but it's there. The trick to solve the puzzle lies in where you meet the two pieces in order to spiral them into a closed loop. It looks easy when you finally know how it's done, but I reckon it's not that simple. I would be surprised if you actually solved this within the first minute... Or even second. 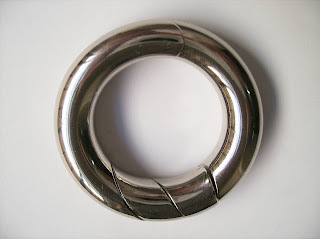 Hanayama released a couple of years later, a Disney version of the Loop, although the concept is exactly the same. It's the perfect gift to get your kids initiated into the wonderful puzzle world, though. Video: Click here to see a video solution of the Cast Loop. Surprisingly harder than I was expecting, the Loop is a brilliant concept made simple. Don't let the level 1 difficulty keep you away from a definitely enjoyable experience, despite the apparent easiness of it. Even if you're an experienced puzzler, I guarantee it, you'll love it. 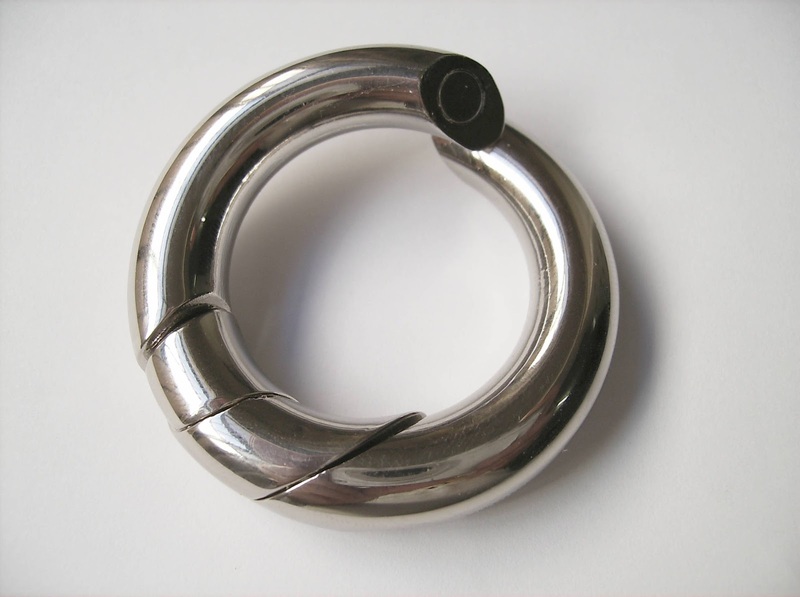 Availability: The Cast Loop is available at the Finish puzzle store Sloyd, as well as the others in the Hanayama collection. Worldwide shipping available. The Cyclone, by The Lagoon Group, is a fantastic puzzle and one of the most stunning in my collection. 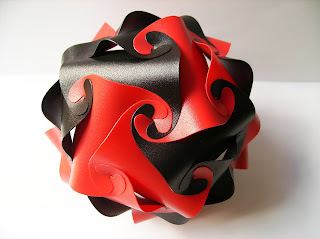 The mesmerizing swirling shapes create a wonderful pattern to look at, however, quite intimidating to solve. 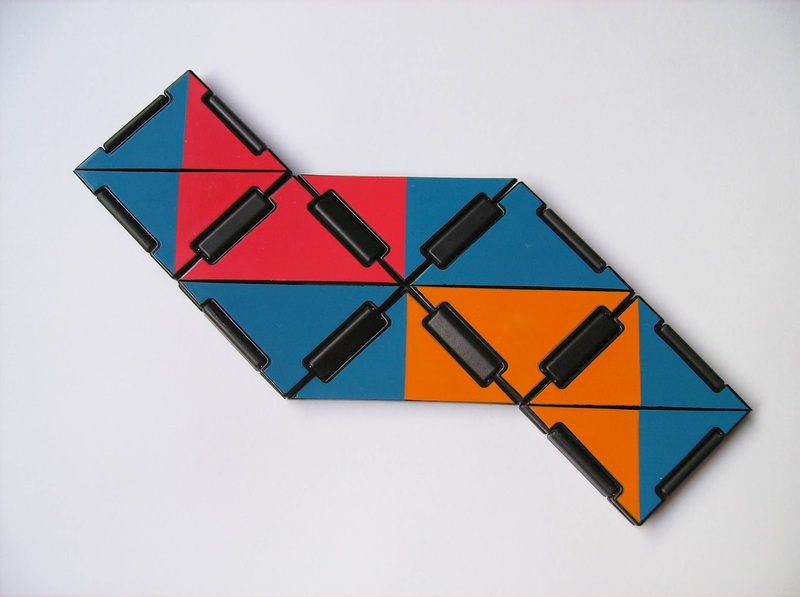 Holger Strøm, a Danish designer, created the puzzle in 1973. The Cyclone is comprised of 30 identical pieces that interlock to form a spherical shape. 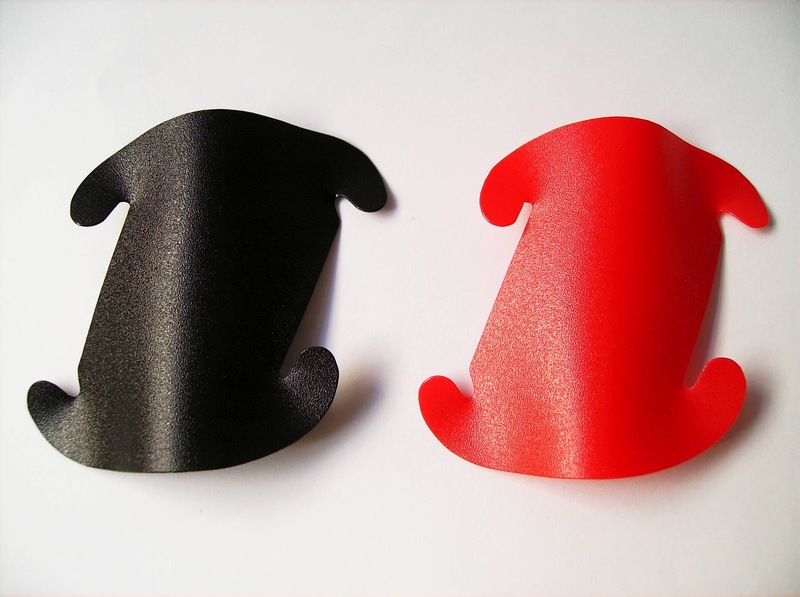 The material is a highly bendable plastic, so there's no risk of damaging it during assembly. It comes already assembled and the idea is to take it apart and then reassemble it back to its original shape. It's one of the lightest puzzles in my collection. I've had this puzzle in my collection for quite some time, and I remember that it took a while before I gathered some courage to take that perfect shape apart. Obviously, I was afraid it would be too difficult to put it back together or that I wouldn't have the patience to finish it... As it turns out, it wasn't so difficult as I was expecting it to be - it just looks scarier than most puzzles you're used to. 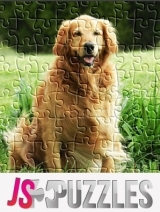 The puzzle comes in several different color schemes, and some are harder than others to assemble. Mine is a two-color scheme (red and black), but there are three colored ones that need a different approach to be solved, because you have to respect a simple rule: there can't be two of the same colors directly touching each other. In other words, straight edge can't touch a curved edge, but they can be touching at a vertex. PuzzleMaster rates this as a level 8 out of 10, but if you have a knack for assembly puzzles, it's a more like a 6 or 7, at most. I believe it took me around 30-40 minutes to reassemble the puzzle, and as I was solving it, I felt it becoming easier with each piece connected. 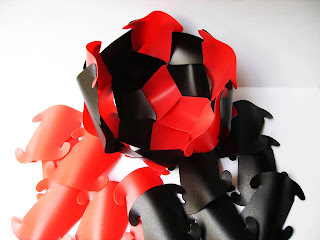 At first, you might feel a bit overwhelmed with all those identical pieces lying around, but as you keep connecting more pieces, the shape begins to take form and it's actually very fun to assemble. As soon as you understand how the pieces connect, it becomes more of an easy task than an intimidating one. 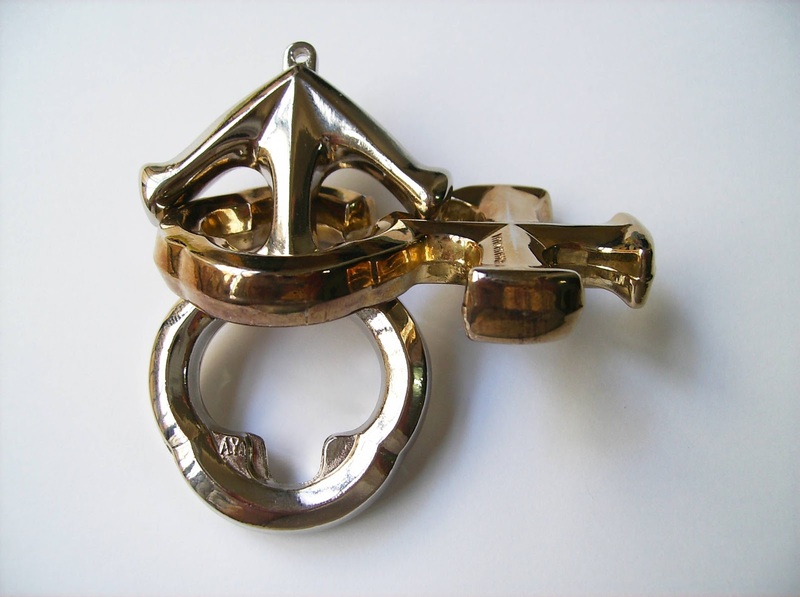 A piece can be viewed as a rhombus with one straight edge and one curved edge. 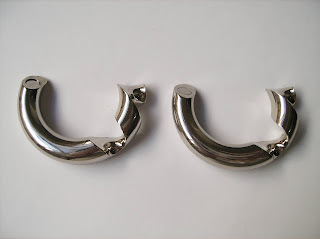 The connection between two pieces is made by having a curved edge connect to a straight edge. This definition is true for all pieces of the puzzle. You can start by connecting five pieces in a circle (they will share the same vertex). When you have that shape, continue by connecting new pieces in a circle. In no time, you'll see the spherical shape coming to life. Not all vertices will have five pieces, though. For each vertex with five pieces connected, there will be five other vertices with only three pieces around it - quite an interesting geometry. The designer has found other uses for this shape, including an impressive range of lamp shades. These are explained in more detail in the IQlight website. The Cyclone puzzle was a joy to assemble, despite the initial fear of having an unfinished project in my hands. The assembly process becomes very intuitive with only a few pieces in, and depending on your skills, it shouldn't take more than an hour to put together. It'll look great on any work desk or on a shelf together with other nice-looking puzzles. Availability: The Cyclone is available at PuzzleMaster for $16 USD. There are currently 3 color schemes available. One of the things that I most appreciate in a puzzle is having multiple challenges/solutions. It gives you something to keep enjoying the puzzle after you've solved it for the first time, expanding its lasting appeal. 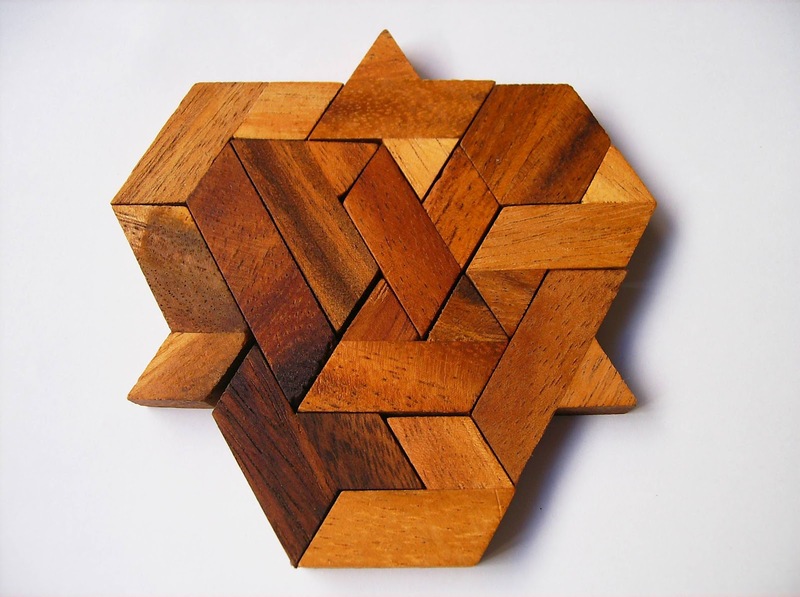 The Hexiamond, from Brilliant Puzzles, is a nice example of such puzzles. I don't know much about its origin or who's the original designer, but given the simplicity of the form and concept of the puzzle, it's possible that more than one person came up with the idea independently. Kate Jones from Kadon Enterprises has designed a similar one that uses the exact same pieces (Iamond Hex), so it's possible that the Hexiamond is based on Kate's design. 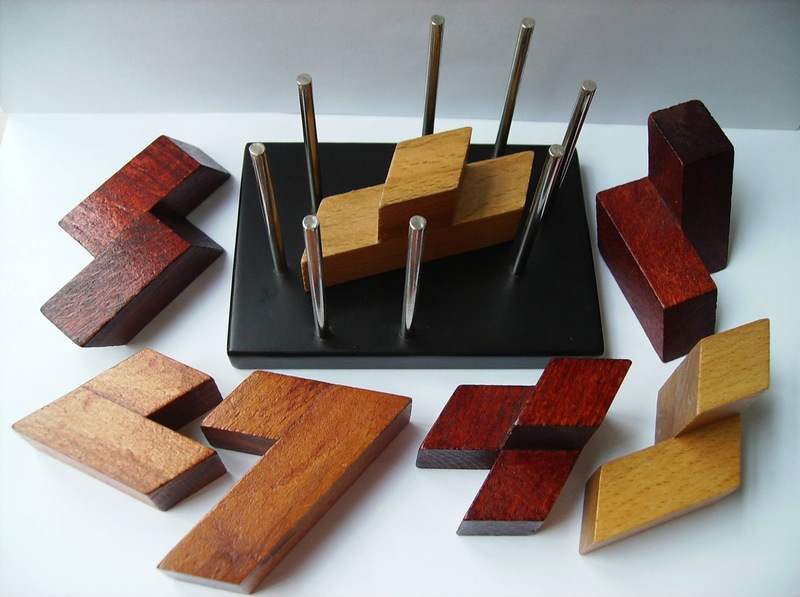 The Hexiamond puzzle is comprised of 12 dissimilar polyform pieces, with each one consisting of six equilateral triangles connected at different angles, for a total of 72 units. 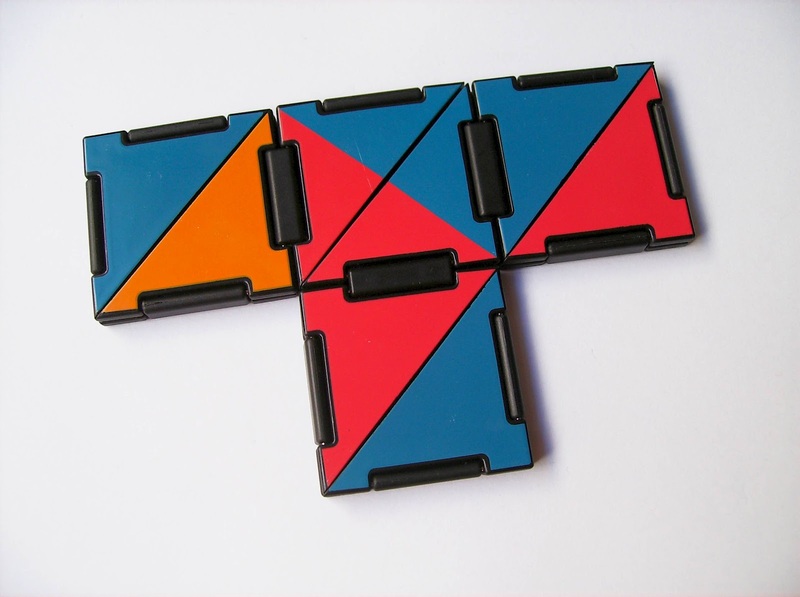 The puzzle comes already solved into one shape, but included in the instructions are twelve other shapes to try as well. The design is a classic box and lid, measuring 13 x 13cm (5.12"), and all in hardwood, pieces included. The tray has the outline of the featured shape carved in, so it's easier to solve. The pieces have this distinct appearance, some with a darker tone than others, giving it a nice contrast between them. 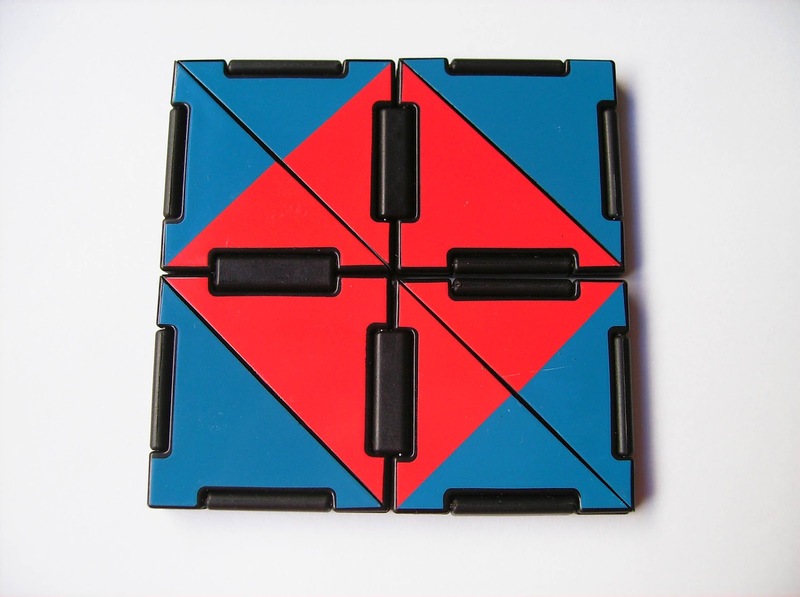 The puzzle is rated with a difficulty level 3 out of 5, but the actual difficulty will vary from shape to shape, as some are tougher than others to solve. The easiest shape is probably the one carved in the tray, because you already have its contours defined. I have photographed three other shapes and the harder one to solve was the Fan (photo below). 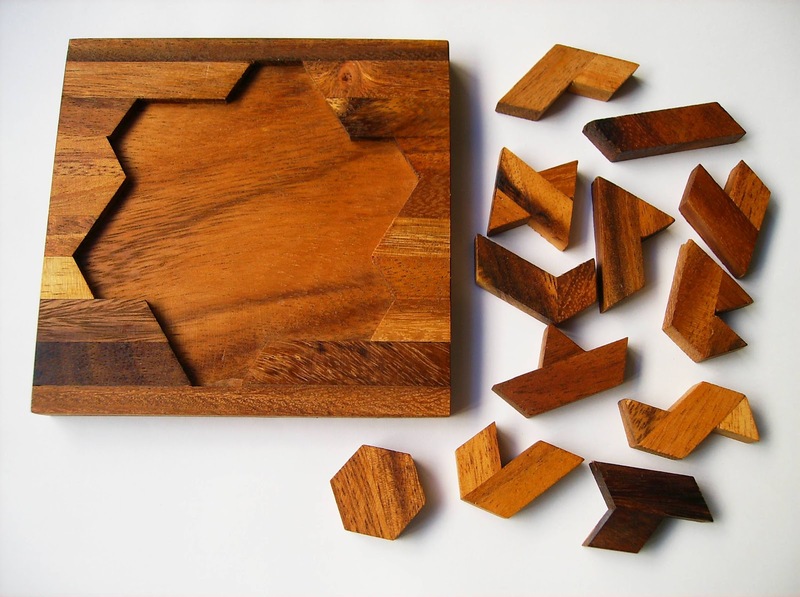 The great thing about this puzzle is that the twelve pieces can make much more shapes than the ones provided in the instructions. You can attempt to create your own, or you can take a look at this website and explore the countless possibilities. Each shape has dozens, and in some cases, hundreds and even thousands of solutions. As you can see, there's more than one way to succeed. Can you find at least one solution for each shape? The Hexiamond is definitely a fantastic puzzle with plenty of challenges to keep you busy for a while. When you've solved all 12+1 included shapes, you can always visit this website and keep playing. A simple complex, but as we all know, sometimes less is more. 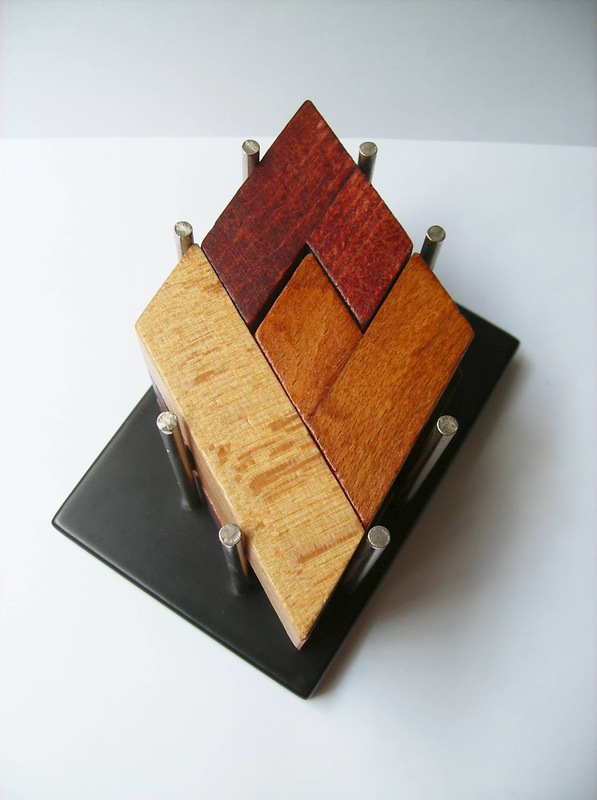 Availability: The Hexiamond is available at Brilliant Puzzles for $12.95 USD. The Cast Radix is one of the most fascinating designs of the Cast Puzzle family. Its striking appearance is achieved by this ancient golden finish, which makes it look more of an art object than an actual puzzle. I bet that if you show this to your non-puzzle friends, only a few of them will say it's a puzzle, if any... Unless they all know that you're crazy about puzzles, in which case they'll still doubt it's a puzzle. 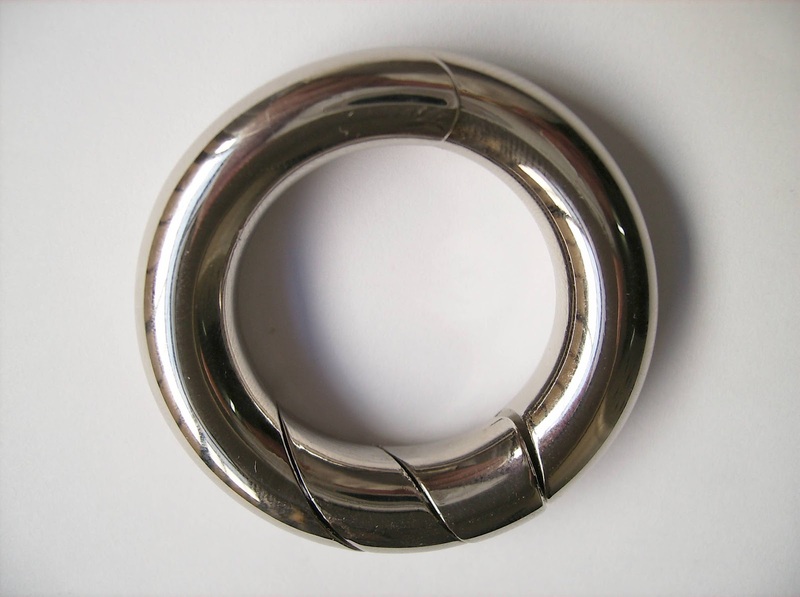 The Radix (from the mathematical term "radical axis") was designed by Akio Yamamoto and released by Hanayama in February 2005. The key word for this one is "sprout", because apparently the main pieces look like two intertwined sprouts. 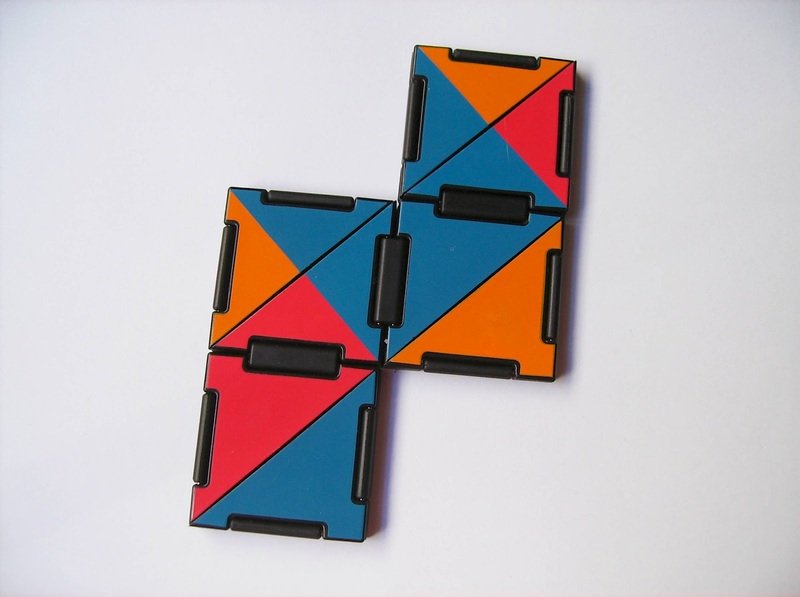 The puzzle is comprised by three pieces, two of which appear almost identical. Almost, because the only dissimilarity is in the bottom part of the pieces, which makes a huge difference, as the puzzle aspect revolves around this characteristic. The goal of the Radix is to remove both sprouts from the base, but the solution, like the shape, is anything but simple. Hanayama rates the Radix as a 4 out of 6, but as of recently, they re-rated some of the Cast Puzzles to a more appropriate rating, and as a result the Radix is now considered a 5 out of 6 - exactly my thoughts. Solving the Radix is a game of patience. It was only after an hour or so that I was able to remove the sprouts from the base. I could classify the movements as somewhat intuitive, because the first part is easy to figure out. However, even though you have an idea of how the pieces should be freed, the final movements don't seem to follow your instinct. Be careful and don't use force, because it's easy to get the pieces stuck in a complex loop. I was a bit careless and had some trouble to try and free the pieces to normal movement again. Returning the pieces to their original state is a less complex task, but it's still a challenge. You need to pay attention to the correct placing of the base and which piece goes first. You might need a couple of tries to figure this out, but you can see right away if the sprout fits the base. After getting the first step right, the following steps are yet another dance of crazy loops in a mad sequence. Even after solving the Cast Radix, I'm still fascinated by it. How Mr. Yamamoto came up with such a design is mind blowing. No wonder he got the Grand Prize at the 25th IPP Design Competition in 2005. 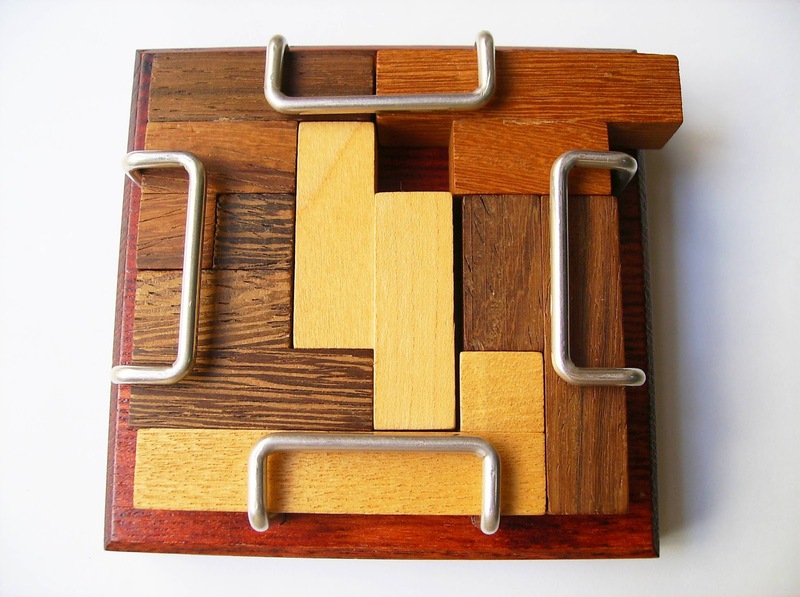 The puzzle is simply a masterpiece and a must-have in any puzzle lover's home. Availability: The Cast Radix is available at Sloyd.fi, and so are all the others in the Cast Series. Over the next few weeks I'll be reviewing 5 of Ivan Moscovich's puzzles currently available at Fat Brain Toys. First up is Ivan's Hinge - A simple concept and yet so fun to play with and extremely addicting. The premise of this puzzle is pretty simple. 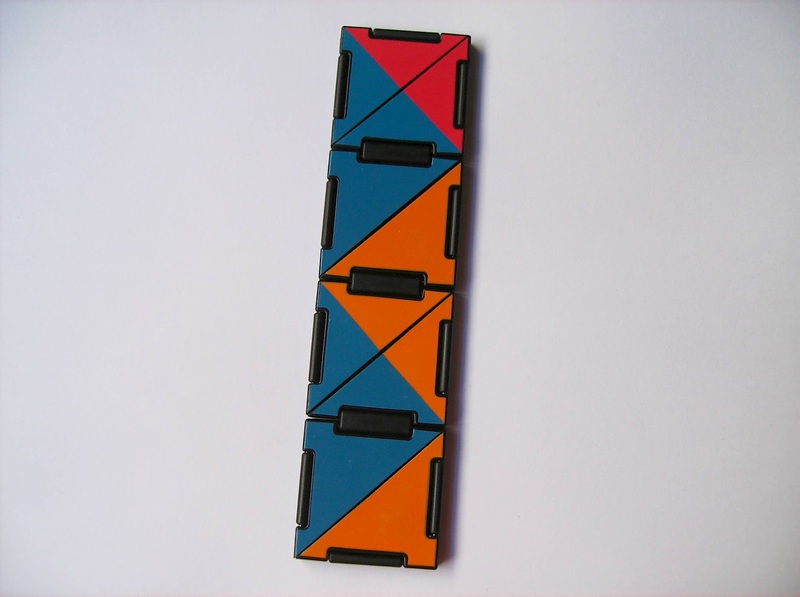 16 colored triangles are connected by articulating joints in a closed loop and by flipping and folding it you can create several different shapes and patterns. It's a straightforward concept that's quite easy to understand, however, a tough one to master. The puzzle is very well built from a strong hard plastic, which is a must if you want it to withstand all kinds of twists and turns and still be playable for a long time. 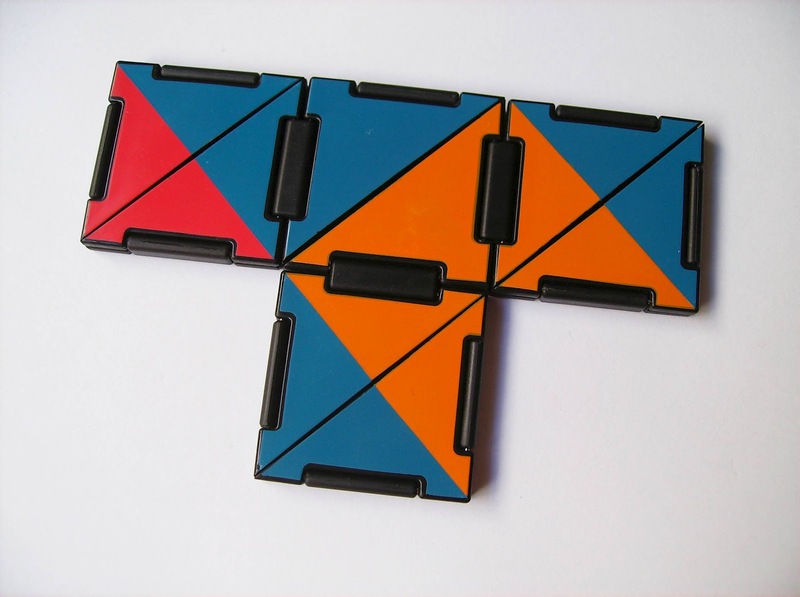 It has a nice portable size (the square shape fits in the palm of your hand) and instead of stickers, which would peel off after a while, the colors are painted right onto the triangles. The hinges behave exactly as you would expect, very flexible, although sometimes they do get stuck, but nothing that a small pressing of a finger won't fix. It's a mechanical puzzle, after all. 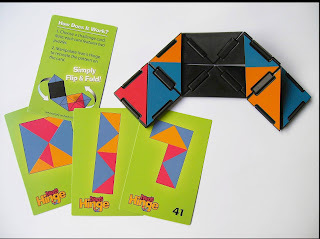 Included with Ivan's Hinge are 56 challenge cards that range from easy to very hard, which will put your visual spatial skills to the test. 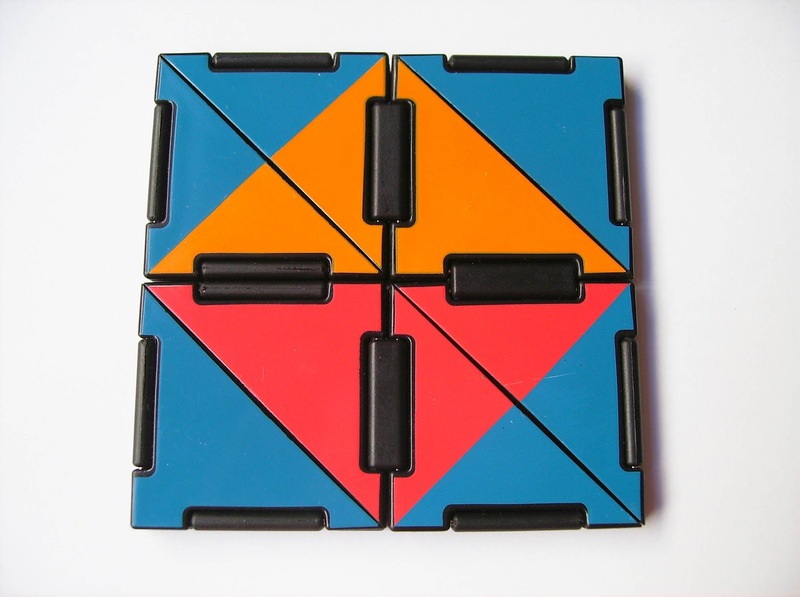 The challenges are separated by five different shapes and within each shape you're required to build several different colored patterns. It took many tries of trial and error until I was able to solve a specific chosen card. After untwisting and unbending too many times, I was finally on the right track. Now the next goal would be to chose a challenge and solve it on the first try. Ambitious, but perfectly doable. You should start by the first challenges, the square-shaped ones. Those are the easiest shapes to manipulate into, and after mastering those you should be able to tackle the more complex ones. When attempting to solve any challenge, you should try and focus on one of its smaller squares. As you may know, all of the shapes that you can do with the puzzle are called tetrominoes. In other words, each shape can be divided into four small squares. 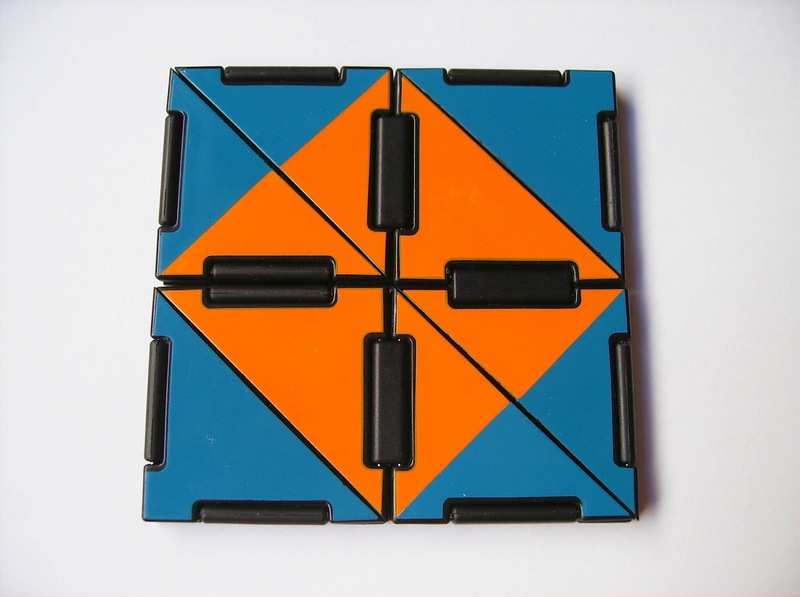 Take the square shape, for example: In order to solve one of the square colored patterns, try to match one of the smaller squares (top right) to the beginning of your loop - that should be one of its four segments. 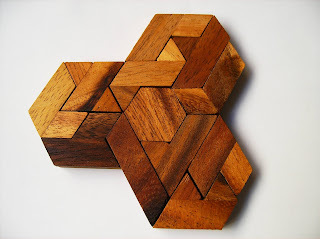 Then, just fold the puzzle around that smaller square, always remembering where it belongs into the whole shape. Curiously enough, I found out that in order to get from one shape to another, all you need to do is a couple of flips and folds. Usually, the colored pattern you get on one side is different from the backside. May be the same coloring pattern, but with different colors or a completely different pattern altogether. It's up to you to find out which ones are equal on both sides. As with everything, practice makes perfect, so just keep trying until you're able to solve all 56 challenges. Ivan's Hinge turned out to be a really pleasant surprise. I really loved the mechanism of the puzzle and how easy it is to manipulate. It's not as easy as it looks when it comes to solve a particular challenge, but it never gets to the point where you just want to give up or feel discourage to keep trying. With patience, you'll eventually get the hang of it, and after that, it will be difficult to put it down. Also a great puzzle to have around to just fiddle with it. 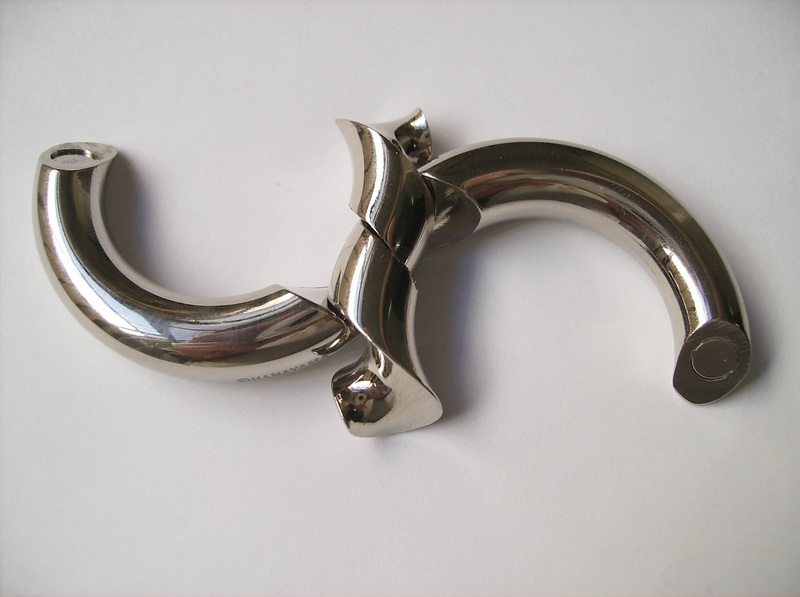 Availability: Ivan's Hinge is available at Fat Brain Toys for about $13 USD. Video: Check out a video demo of Ivan's Hinge in action.